The site of Kent’s Cavern is one of the most important early archaeological sites in the United Kingdom and caused a heated debate between palaeoanthropologists over the age of the KC4 fragment of human jaw in 2011. In 2017, a team of archaeologists re-assessed the archaeological sediments. The Torquay Natural History Society in 1927 put together a team of archaeologists to excavate Kent’s Cavern. That year they discovered the most important hominin bone fragment of the excavation, a fragmented maxilla now available to view at the Torquay Museum. The quality of excavation at the site was not great and the history of work there, hampers attempts to understand the formation of the site. It has been known locally since at least 1659 and excavation of the site is first documented in 1824, by the work of Thomas Northmore. His work then in turn attracted the attention of William Buckland, who was then Reader in Geology at the University of Oxford. When the Roman Catholic priest John MacEnery discovered flint tools beneath the stalagmitic floor of the cave (considered ‘flood deposits’), his work was ignored for being contrary to the biblical teachings of genesis. That did not stop further excavation at the site which continued from 1846 to the 1890’s. This work was not done to 21st century palaeoanthropological excavation standards and inevitably caused problems when it came to dating the hominin activity within the cave. It was not until 1989, that radiometric dating was applied to the KC4 jaw fragment, providing an age of 30,900 years. A few other faunal bones, including one of an Coelodonta antiquitatis (Woolly Rhino) provided an age of 37,000 years. But the faunal bones were found about a meter higher up in the stratigraphic sequence. More work needed to be done to clarify why the older faunal remains were found above the KC4 maxilla. In 2011 an interpolation model was applied to the radiometric dates provided by the fauna and concluded that the maxilla may date to between 44,200 and 41,500 years of age. These results caused heated debate, with critics arguing that the Kent’s Cavern team were too trusting of the interpreted site formation processes. Many academic papers were published laying out why there were considerable problems with this new approach, which employed Bayesian statistics. It was not the latter that was the problem, it was the fear that the cave sediments had been severely disturbed, making the dating of the site a very difficult process. In 2017, another paper was published on a re-analysis of the excavations. The team of archaeologists working on this paper concluded that the quality of the excavation was done to a “reasonable standard”. The excavations were supervised by trained archaeologists during the 1920’s, some of whom worked with the great Dorothy Garrod previously. From January 1926 to July 1928, H.G. Dowie, Frederick Beynon and Arthur H. Ogilvic co-directed for three field seasons. From 1929 to 1935, Beynon and Ogilvic co-directed and from 1936 – 1941 Ogilvic directed the excavation seasons. These archaeologists supervised teams of excavators who had experience in excavation previously at Torcourt Cave. The methods of excavation differed little between Kent’s Cavern and Torcourt Cave. Small picks were used to remove the sediments which would be put through a sorting process. So, it seems that the team of excavators, mostly members of the Torquay natural history society exercised “considerable care” in the removable of sediments. In the 2017 paper, the team of archaeologists excuse the use of blasting to get at the important sediments covered in boulders and massive stalagmites. It is common to see archaeologists use large drills to split rocks at various European palaeoanthropological sites. Sieving was not employed due to the nature of the sediments to form clay balls. Hand sorting was deemed the most efficient method of sorting and indeed the discovery of small spalls resulting from scraper retouch is a testament to the quality of the sorting. The vestibule chamber of Kent’s Cavern showed signs of heavy flooding, which overturned older deposits over younger ones. Stone tools found in these layers testify to this, with Middle Aurignacian stone tools found above Upper Aurignacian stone tools. In 2011, the stone tool remains were re-examined and the characteristics of the stone tools have not warranted the separation of the assemblage into two. There is just one homogenous group of Aurignacian stone tools. Certain elements of the Vestibule Chamber sediments were excavated using modern excavation techniques and confirmed that the sediments formed not by heavy flooding, but by a less energetic environment. All deposition occurred gradually in ways one would expect in caves, such as cryoturbation, soil creep, minor hill-wash, and cave wall collapse. The fastest phase of deposition within the chamber took place within a 1,000 to 2,000-year period, which accumulated about 1m of sediment. According to the re-analysis of the stone tool assemblage and the site formation processes, it seems the cave was not susceptible to high energy deposition that would cause the dramatic overturning of older stone tools over younger stone tools. Twelve new Accelerator Mass Spectrometer (AMS) dates were successfully obtained from the faunal bones. The oldest tooth, a Bovid (Ancient Cattle) dated to 38,900 BP, while the youngest, a Crocuta crocuta (Hyena) dated to 30,630 BP. The new radiometric dating results were inserted into the interpolation model previously constructed in the 2011 paper and suggested that the hominin maxilla dated to between 40,500 and 42,500 years of age. With a 95% probability that the maxilla is about 42,350 years old. While caves remain difficult archaeological sites to excavate, revealing complicated stratigraphies, it is important not to entirely dismiss the work done at Kent’s Cavern or any other archaeological site. 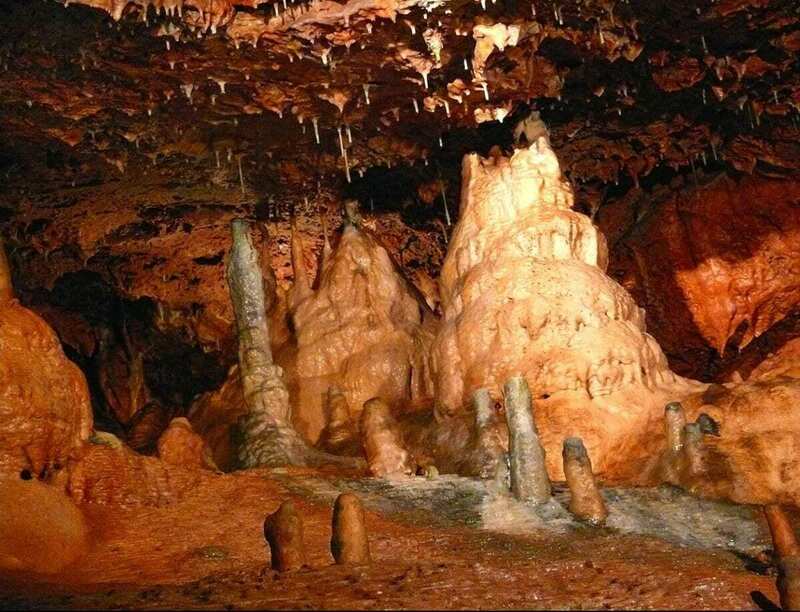 Some caution is necessary, but Kent’s Cavern has provided the palaeoanthropological community with the possibility that Homo sapiens were roaming the British coastline as early as 42,000 years ago. Pestera cu Oase, Romania may not be the earliest evidence of this species of hominin in Europe after all.